Saving space inside the home is one reason people are considering outdoor storage options. Looking to reduce clutter inside the house or tidy up the yard? The outdoor storage options available these days range from small weatherproof cabinets through to tools sheds which are quite large garden sheds. With space inside the home at a premium it simply makes sense to move what you can outside – ideally into secure, weatherproof storage that looks attractive and is maintenance-free. There are a number of manufacturers who specialise in storage units designed for outside use, including KETER, LIFETIME and SUNCAST. Typically these products are made from UV-stabilised plastic, either polyethylene (HDPE) or injection-moulded polypropylene; materials which resist denting and chipping and which will not rust or rot. 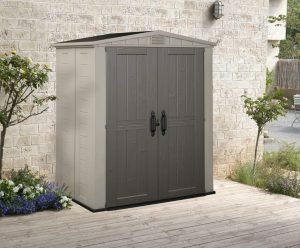 If you are considering outdoor storage options, Landera offers a good range of types and sizes. Some of the most popular are the KETER OPTIMA WONDER and the FACTOR range of garden sheds. (The FACTOR range is even more attractive at present because of the bonus offer on KETER plastic sheds that is available until 30th June 2014)! One very useful feature of the SUNCAST, LIFETIME and KETER products is that their construction includes the floor as a structural component. This makes installation quick and easy, as there is no need for a concrete slab or timber base – all you need is a firm, level site. To find out more about, follow the link: outdoor storage options. With Landera,delivery of the outdoor storage units is FREE not only in Sydney, Melbourne and other major centres but also to most places within Australia.